Hace unos días os hablábamos del signo que habíamos elegido para el proyecto de comunicación del Colegio Público "Roces" - Colloto. Además del signo hemos preparado la web que intenta dar a conocer a la comunidad qué encontraremos en el colegio, qué proyecto educativo tiene, cuáles son las actividades que realiza. En definitiva los contenidos de tipo institucional debían conjugarse con el resto de la actualidad de la vida del centro. Por ello planteamos una división estructural muy compartimentada, un juego iconográfico (imagen+color) nos ayudó a marcar estos diferentes campos informativos. 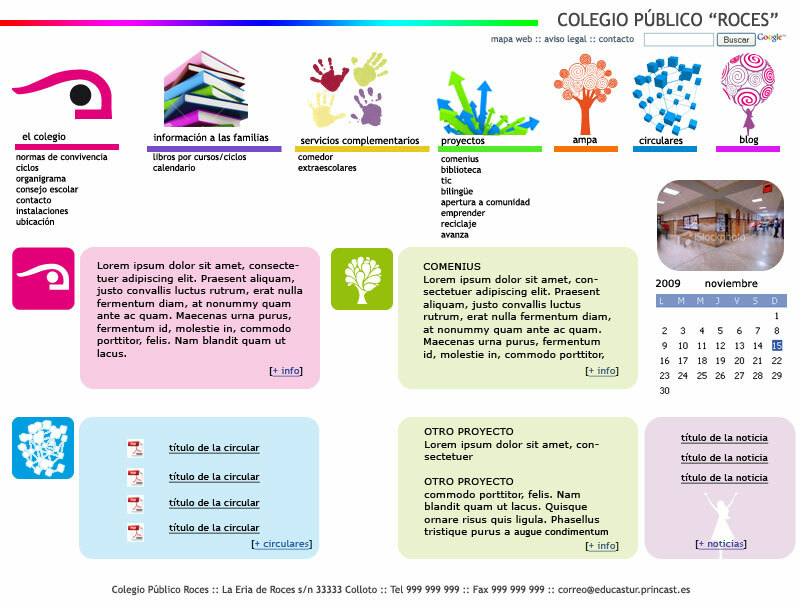 Some days ago we told you about the sign we had chosen for the communication project of "Roces" - Colloto Public School. 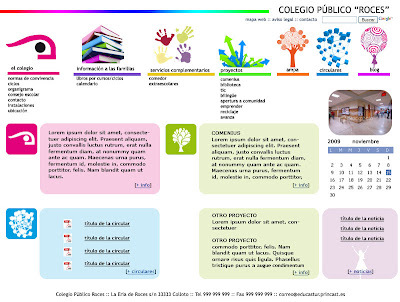 Besides the sign we have prepared the web site, which tries to let the community know what we can find at the school, which educational project it has, which activities it carries out. In short, the contents of the institutional type should be combined with the rest of the news about he life at the centre. That is why we set a very compartmentalized structural division; an iconographic game (picture+colour) helped us mark those different informative fields. We leave you a screen shot of the final proposal accepted for the public part. The aesthetic was also integrated in the school blog. Y un conjunto de iconos que regulan la parte dinámica de creación de los contenidos de la parte pública desde la de gestión de contenidos. And a set of icons that regulate the dynamic part of the creation of the contents of the public part from the contents management section.